Determined to remove unnecessary complexity from the hair care industry, ELEVEN Australia had an idea of creating easy to understand but effective hair care products. 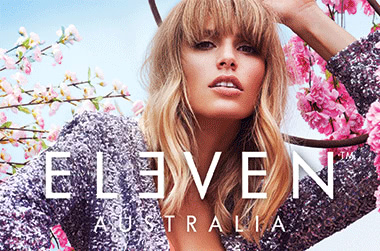 Developed by a team of expert hairstylists and creatives, ELEVEN Australia have products for all hair types which do exactly as they say on the packaging. Whether you’re looking for volume in fine hair, hydration in dry hair, or smoothing down unruly hair, things couldn’t be easier than with this innovative hair care brand. If you’re looking to try out their products for the first time or if you’re just stocking up on travel-friendly goods for your holiday, we offer a large selection of miniatures from ELEVEN Australia to make shopping that much easier. The Hydrate My Hair Shampoo and Conditioner are favourites amongst Adore Beauty customers and are the perfect way to boost moisture levels in dry and very dry hair. For fine and oily hair types, we recommend the I Want Body Volume Shampoo and Conditioner which help to thicken and strengthen hair without weighing it down for effortless body and volume. ELEVEN Australia have also developed their Smooth Me Now Anti-Frizz Shampoo and Conditioner which are particularly good for tackling frizz-prone and unruly hair. To keep blonde hair looking fresh and free from brassy tones, we recommend the Keep My Colour Blonde Shampoo and Conditioner. We don’t just have traditional shampoo and conditioners available in miniatures, The Give Me Hold Flexible Hairspray and Give Me Clean Hair Dry Shampoo are perfect styling aids for on the go use to lock in a look and keep hair looking fresh all day long. I love when products have 'mini' products so that you can try it out without having to buy the large size. This was a lovely conditioner. Left it in a few minutes and rinsed. Cant fault - would definitely get again. Super handy & great value! Awesome for travelling, you get a good 3 or 4 uses out of these tubes which is fantastic. Sometimes I buy them just to switch up from the other shampoos/conditioner I am using.